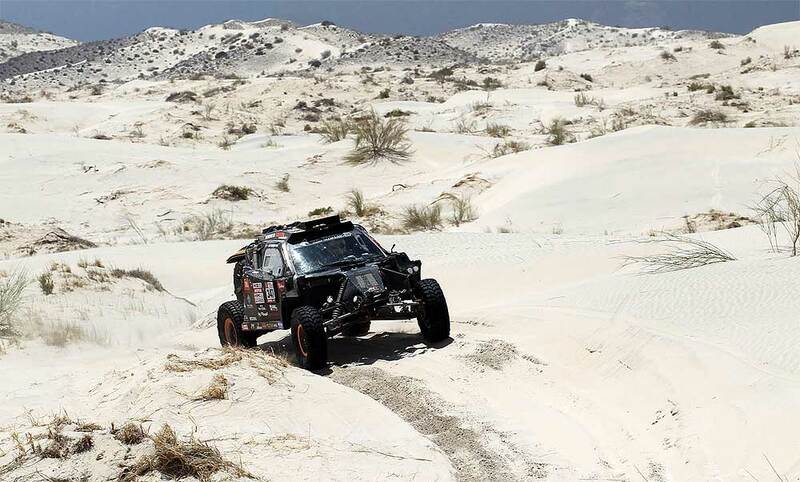 During SS11, Tim and Tom Coronel have achieved their best result to date. In scorching hot and tricky conditions, the duo scored a top 25 finish. After the unique victory by Bernhard ten Brinke, that completed a beautiful day for the Dutch drivers. For the Coronels, the result could have been even better, because the day didn’t run entirely trouble-free. Nevertheless, happiness prevailed afterwards. "So hot, extraordinary," Tim reflected on the day. "But fantastic that we have achieved this result. It had been on the cards for a while, but now it finally worked out. And we could have been a lot faster. On two occasions, we had problems with the tyre deflation system of the left rear wheel. We had to get out of the car to solve it. That was a pity as it cost us about a quarter of an hour. But there is more to come. Dakar, we aren’t done with you yet!" Co-driver Tom admitted that it wasn’t an entirely flawless stage: "In the desert, it went fine, but once, Tim went too fast going down a dune. It was a real ‘Duke of Hazzard’ style action, ten points for his performance! We landed nicely on the nose. Fortunately, we were able to continue, although the front bodywork was gone. Now, the buggy is simply a little more naked than it was already. There is an advantage, too: The cooling at the front was no longer an issue! Our apologies to the sponsors who had their sticker at the front of the car, but we will make up for that,” he said with a laugh."